HAPPY DONABE LIFE - Mrs. Donabe's Rustic Japanese Kitchen: Sizzling donabe musorooms and tofu with "taberu la-yu"
Sizzling donabe musorooms and tofu with "taberu la-yu"
Here's another great dish to serve with my chunky taberu la-yu (hot sesame oil). 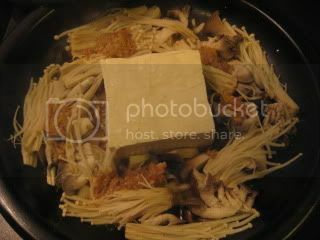 The dish itself is another twist from my sizzling donabe mushrooms. I used my tagine-style donabe, "Fukkura-san" for this dish. I made it without anchovy or balsamico this time, and instead added tofu. 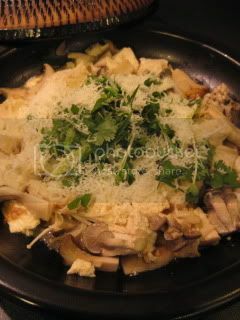 On the skillet of Fukkura-san, I spread mixed mushrooms, and laid a block of tofu in the center. Drizzled the mixture of sake and our homemade miso (1.5 tbsps each), covered and cooked for about 8 minutes over medium+ heat. Once they were cooked, they were covered with grated pecorino cheese and chopped cilantro. Everything was then mixed by a serving spoon and served in to plates and a generous amount of the chunky la-yu was drizzled. It was so delicious and tasted really great with some plain donabe brown rice.